The G's Semapaka is a semi-automatic bottle to case packing system which with the attention and operation of only one person will handle up to 18 cases per minute, that is for example - 216 bottles on 12 packs etc. 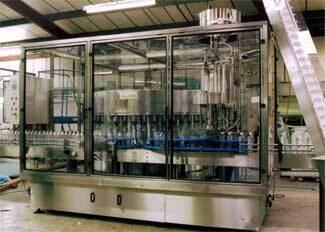 The concept is very simple and the machine is therefore easily maintained. Although incorporating the best elements of modern electronic and pneumatic control,''the technology has been best conceived for reliability and user friendly operation. The machine is universally adaptable to a wide range of bottling industry requirements based on extensive experience of supply of bottling equipment to the most prestigeous multinational food, drink, personal and household product manufacturing companies. The simplicity of design offers purchase, installation and operating costs which result in an attractive payback.